Even at her young age, Kiernan Shipka is all ready a red carpet favorite. 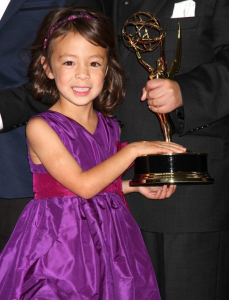 The Modern Family cast were the big Emmy winners again in 2012 with the assemble cast taking home best comedy for the third year in a row, a directing honor for co-creator Steve Levitan and acting wins for Julie Bowen and Eric Stonestreet. HMB’s favorite portion of the of this awards show, aside from the video excerpt posted in HMB’s side bar, were the dresses worn by red carpet pro Kiernan Shipka (pictured left) and new-comer Aubrey Anderson-Emmons (who plays the new and improved Lily on Modern Family). This was definitely Aubrey’s break-out moment as she wowed on the red carpet and then again in a hilarious video with her cast mates and comedian Ken Jeong. 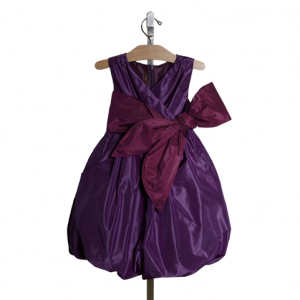 Aubrey’s royal purple, silk bubble dress was custom-made for her by HMB favorite Tea Collection and is now available for pre-order here. The color flatters her skin tone and the look is pulled together with patent flats and the perfectly matching headband. The dress alone will set you back about $180 dollars but have your little one wear it for Thanksgiving, Hanukkah and Christmas (not to mention holiday photos!) and you’ll more than get your money’s worth. We look forward to watching Aubrey’s style develop on screen and off for many years to come! The “Lily Dress” is available for November delivery. Aubrey flanked by her dapper child co-stars Nolan Gould and Rico Rodriguez. Every 5 year old’s obligatory red carpet accessory: the stuffed animal.